Yes, I did mean “solace,” not “solstice.” Solstice was last month. Solace was two hours this afternoon. Just after noon when I looked out our kitchen window, the sunny scene beckoned me to come outside and enjoy a beautiful winter afternoon. As I looked at the scene, I noted some green in our small raspberry patch—green as in winter weeds. Why not go out and cut back the raspberry canes and weed that bed, I thought? The sun is brilliant, the temperature 42°F and slowly rising. The brick wall of the detached garage protects the bed from the light afternoon breeze from the northwest. I can sit with my loppers and short-handled weeder in the comfort—the solace—of the January sunshine. In an hour the job will be done. The January sunshine was comforting, even relaxing, good for a gardener’s impatient wintertime soul that already thinks about spring plantings. I filled the wheelbarrow with cut canes. As I loosened and pulled winter weeds, the six or seven I had estimated turned into 16 or 17 and then 60 or 70, and then I lost count. I filled one five-gallon bucket with weeds and leaves, then a second bucket, and then a third. The cool breeze stiffened, and the wind-chill factor dropped slowly as the sun moved lower in the western sky. A drop of sweat formed on the tip of my nose. Hmm, that wasn’t sweat. My nose was getting cold. I soon finished and wheeled the “harvest” downhill to a crude compost pile at the edge of our woods. But the job was done. The canes were cut to the ground. The winter weeds were history—hopefully, but I know there must be hundreds, if not thousands, of dormant weed seeds just waiting to sprout during the next warm spell. 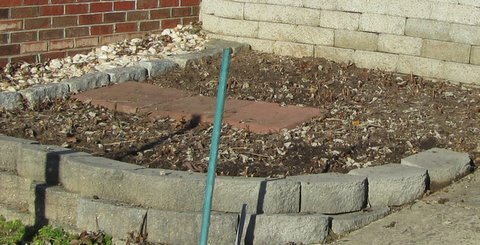 The raspberry bed looked relatively neat, even ready for spring. I’ll add a thin layer of composed leaves/horse manure when I buy a load at the composting facility at our county landfill in February or March. Have you ever thought you’d like to grow raspberries? Our patch is seven years old now. I bought six plants by mail order. I suppose I had beginner’s luck when I chose Heritage, a red primocane-bearing variety. I really hadn’t “read up” on raspberries before I got started, but I had learned that there are two basic kinds of red raspberries—summer-bearing and primocane-bearing (sometimes called everbearing). Primocane-bearing varieties fruit in late summer until frost on canes that grew that year. Summer-bearing varieties fruit earlier in the summer on canes that grew the previous year. The difference was attractive to this rooky raspberry grower. With primo-cane bearing plants I would have simply cut all the canes to the ground, and, presto, the plants would grow new canes and fruit the next year. If I had bought a summer-bearing variety, I would have to keep track of which canes grew which year and remove only the “old” canes and not the “new.” Now which cane is “old” and which is “new”? Actually, it’s not too hard to tell, but, as I said, I knew little about raspberries then. The Heritage raspberries have done us well. We pick quarts each summer from their small, 10’x10’ bed. Early on we eat them out of hand as we pick then. Then we use them on summertime cereal and in fruit salads. Some go into freezer jam. We share some with friends. Ellen spreads the “extras” on cookie sheets, freezes them for a couple of hours, and bags them for wintertime use. When fresh raspberries sometimes cost $10 to $12 a pound at the grocery store, we just smile and wonder when other gardeners are going to start planting raspberry patches. I certainly encourage you to grow this mouth-watering, easy-to-grow fruit. But if you decide to start a raspberry patch, I highly recommend that you to learn as much as you can about growing raspberries before you begin. A great place to spend an hour getting an unaccredited B.S.R.G. (Bachelor of Science in Raspberry Growing) is the 40-page Chapter 8, “Brambles,” in The Mid-Atlantic Berry Guide for Commercial Growers. You can access the Guide online by CLICKING HERE. 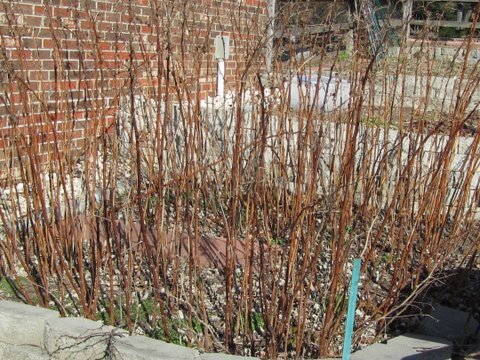 You can cross-check the Guide’s list of recommended cultivars with the much shorter University of Maryland Extension’s “Bramble Cultivar Recommendations” by CLICKING HERE. And I add one note that most publications haven’t yet added to their text: Raspberries are a favorite food of brown marmorated stink bugs. If you have concerns about using pesticides, you should do additional investigation into what researchers are recommending to control this destructive insect. 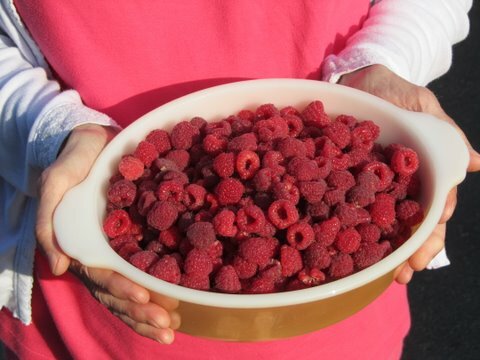 Great post, I would love to grow raspberries, but since I am renting it would have to be in a planter. Do you think they would grow successfully in a pot? I just read about a new group of small fruit plants- BrazelBerries Collection- that will be introduced in 2013 by Fall Creek Farm & Nursery in OR. These “ornamental fruit shrubs” (raspberry, blueberry) will be compact and fit well into edible landscapes according to the company. I just asked Fall Creek if we could buy some in 2012 to use them in demo gardens. I've never grown a raspberry plant in a container, Sportsgirl, but several online sites say it can be done. Here's one: http://www.container-gardening-tips.com/container-fruit-gardening/growing-raspberries-in-containers.html That should be even easier if you use the small plants that Jon Traunfeld commented about. @Sportsgirls. Check my post on growing black raspberries on the Grow IT Eat IT blog. I grow mine in container because their growing habit are perfect for that use.